Her assist on Gucci Mane’s “Make Love” gives the rapper 73 career Hot 100 hits. 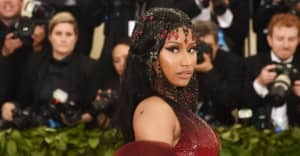 Nicki Minaj has tied a chart milestone set by Aretha Franklin, tying the singer for most Hot 100 singles among women, Billboard reports. Minaj and Gucci Mane debuted at No. 78 on the chart this week with "Make Love." The single marks Minaj's 73rd appearance on the Hot 100. Minaj's first Hot 100 single came in 2002, as a featured artist on Lil Wayne's "Knockout." Over the course of her career, she has earned 13 Top 10 singles and peaked at No. 2 with 2014's "Anaconda."